Being thought of as a local "character" does not bother musician René De La Prade in the least. On the contrary. "Yeah, me being thought of as a 'character' is kind of inevitable," she says with a laugh. "I guess I just have a hard time being conventional. If I dressed and behaved like everyone else, I think I'd be really bummed out all the time. "Born in Nicasio, De La Prade rose to local- character status while playing accordion for tips on the streets of San Rafael, often doing so while dressed as a pirate. "I used to busk a lot, but I had to stop," she says. "It wasn't worth the effort. If people want good street musicians in San Rafael, they have to learn to tip better! "Though she still plays for tips, her faithful legion of fans know her mainly as a member of the rising punk-powered Celtic band Culann's Hounds (www.sfhounds.com), a high-energy ensemble playing traditional Irish and Scottish music with an appealingly nontraditional stage presence. Not only does De La Prade play the accordion like she was trying to make it catch fire, she has a certain knack for combining apparel. A few months ago, for example, you might have caught her wearing a WW II aviator's helmet, with a vintage T-shirt topped off with a weathered pirate jacket, super short miniskirt and knee high socks, with a flash of bare thigh that she says made the whole ensemble work. "These days, I've maxed out my pirate clothes. It works for me, because when you think of it, the button-box accordion is a very piratical instrument. Actual pirates played them. And they hold up well in extreme environments." The same might be said for De La Prade.Culann's Hounds play April 2 at the Fourth Street Tavern, 711 Fourth St., San Rafael. 415.456.4828.—D.T. "I'm kind of a late bloomer," Ann Trinca laughs. "It wasn't until I was in my 30s that I realized that I could do something and if it didn't work, that was OK." Thank goodness for advanced age because Trinca, now 37, has taken another flyer doing something that could possibly not work but emphatically does.With encouragement from gallery owner Jessel Miller, Trinca has opened the Nest—part art gallery, part happenings space, part studio, part curio shop—with photographer Norma Quintana in downtown Napa. With its sign cribbed by Quintana from the remnants of a national grocery chain, the Nest, signifies "building an environment with everything that you use and create," Trinca says.Tired of urban life after living in San Francisco in her 20s, Trinca came to Napa to take a position with the then-fledgling Napa Valley Arts Council. There, she was part of a two-person team putting on open studios, hosting exhibitions and serving the valley's art community. 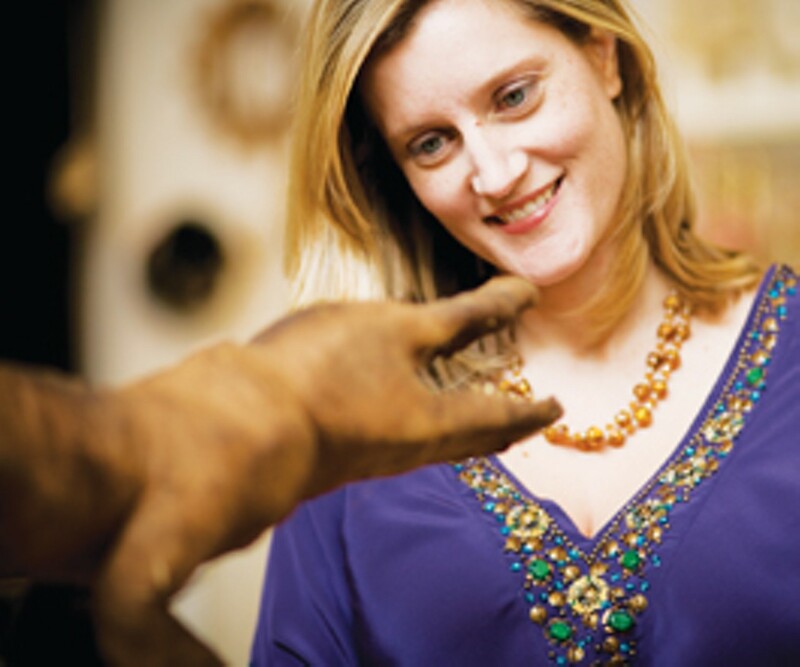 "And that's how I came to know more about Napa's art community," she says simply. In 2002, Trinca helped to cofound Pearl Necklace, a hand-made post-feminist zine famous for its great launch parties and quarterly issues featuring such ambitious themes as motherhood. It folded in 2006. "The Nest is sort of a physical of manifestation of Pearl Necklace in that I want to bring in everybody from all sorts of backgrounds and get them to experiment," she says. The current exhibit is "Natural History" and, as with all Nest shows, a portion of proceeds go to the "Nest egg," a burgeoning grant pool from which Trinca and Quintana plan to begin awarding monies through the arts council. "Our motto," Trinca says with cheer, "is 'Live creatively, give generously. '"The Nest, 1019 Atlas Peak Road (behind Jessel Gallery), Napa. A terrarium workshop in conjunction with the current exhibit is slated for March 29 at 11am. $45; reservations required. 707.255.7484.—G.G. It says a lot about Ralph Morganbesser that, before we start talking, he sneaks a chunk of sauerkraut. I still remember his reaction the first time I ordered a hot dog from him, half my life ago, asking for as much sauerkraut as possible. "A man aftah my own haawhhht!" he howled in his thick Brooklyn accent, clutching his chest in mock exhilaration and happily piling on the holy condiment. 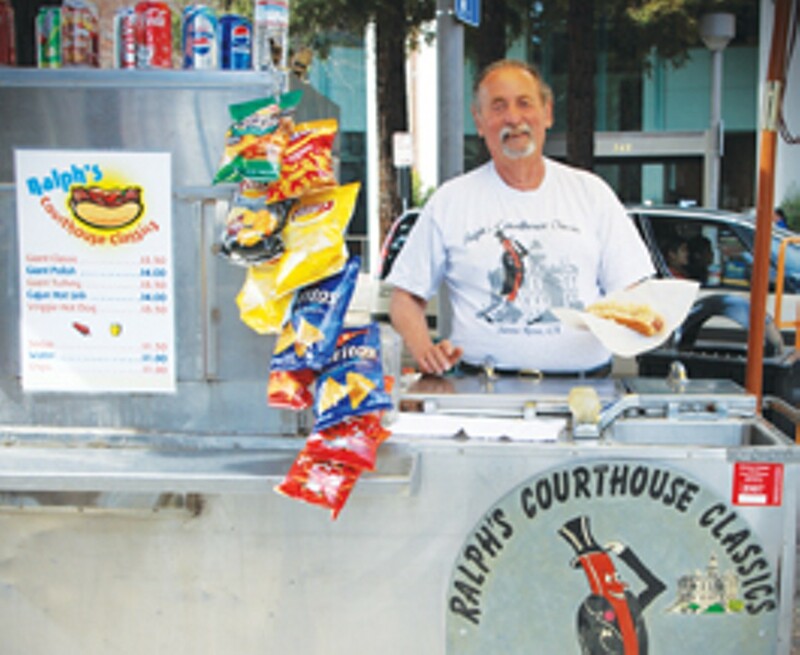 If Santa Rosa is an office, Ralph's is the water cooler, where everyone from street people to city workers to what he describes as "lotsa lawyers" come each day for their lunchtime fix. "I'm an ex&–New Yorker," Morganbesser explained last week, "so just the multitude of personalities, it's stimulating. Some of 'em are comics, y'know, they got the sense of humor, some with the sports, some with the intellectual, some of just the heartfelt stuff. Right from the heart. I think one of my attributes is that I treat people so equally, they feel like there's no ups or downs. I talk to everyone the same way." Morganbesser interrupts himself to shout a phlegmy "Shalom aleichem!" to an aging man passing by. "I have a philosophy in downtown," he says, "that there's a lot of people who have a hard life, are challenged mentally and physically, ya' know. I like to catch their eyes and make 'em smile, or say hello to 'em. Sometimes, I'm these people's only contact, and I enjoy that—makin' 'em feel it's not so crazy and wild out there." After almost two decades of serving hot dogs, Morganbesser's got no plans to retire. Not, at least, until his true mission is complete. "I been tryin' to get this community to eat sauerkraut for 17 years!" he pleads. "I've converted a few—I even beg 'em sometimes. I go, 'Listen, it's a big dog. Can I just put a few strands on the tip and let you taste it?'"—G.M. Yellow police tape encircles the crime scene, holding the gawking crowd of students back from the chalk outline of a sprawled figure and scattered evidence. Is this another tragic campus shooting or a local filming of CSI? No, actually, this is the eighth-grade science lab at Twin Hills Middle School, the domain of Mary Fitch, science teacher extraordinaire. 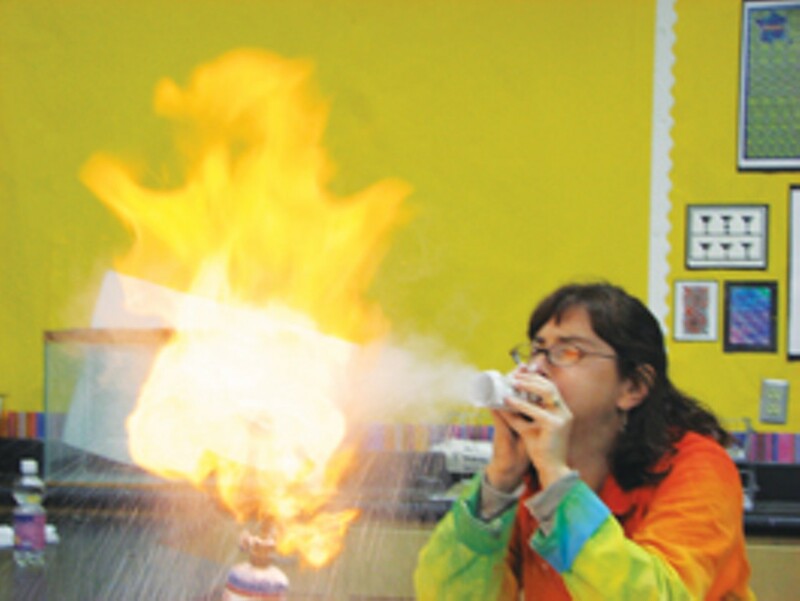 Ms. Fitch, as her student's fondly call her, has entertained while teaching students for 13 years at this Sebastopol school, exploding glass bottles into a million pieces, blasting off rockets and shooting bullets made of toilet paper and baking soda while teaching the fundamentals of science. The crime scene starts off the year's eighth-grade curriculum by demonstrating how science is applied in the "real world." Fitch is a Stanford-educated geologist. "The job is a perfect match for me," she says. "The world is so exciting. We make fireballs year after year, and we never get tired of it. When I ask the other teachers what they did they say, 'We taught commas and semicolons,' and I get to say, 'I lit my desk on fire.' I feel so sorry for my friends in English." Dressed in her tie-dyed lab coat, Fitch reminds students of The Magic School Bus' Ms. Frizzle. In order to teach Newton's laws, for example, Fitch has students build racecars and run them down a steep ramp she's constructed in the classroom. The car then hits a brick wall, ejecting its "passenger," a raw egg. The student must catch it with bare hands for a successful conclusion to this wild ride of an experiment. "At our school, we have reverse peer pressure," Fitch says. "It's cool to be a nerd."—S.D. 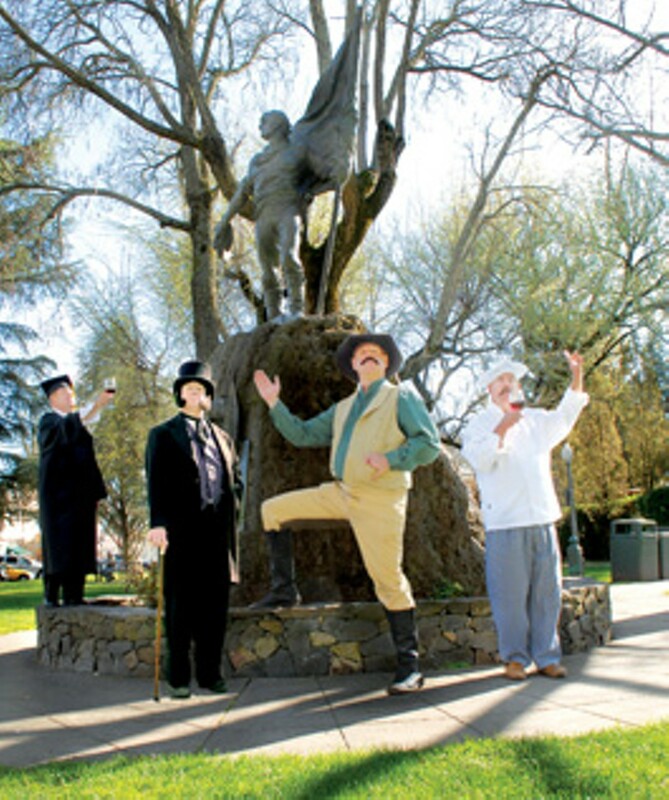 George Webber struts across Sonoma's Plaza, his voice booming, and you might think he owned the town. In fact, Webber is an ordinary citizen, although "ordinary" isn't a word he ordinarily uses. Born in Iowa, and a Californian since 1972, he promotes himself as "Sonoma's Professional Multiple Personality Artiste." That means he acts out one or more of the colorful dramatic roles he's created for himself from history and his imagination: Mark Twain of Huck Finn fame; Luigi, an operatic Italian waiter; Professor Vine, a wine snob; and General Mariano Vallejo, arguably the first Californian. He's best as Samuel Clemens, the original literary split personality. Sometimes Webber charges a fee; sometimes he acts for free. He moves back and forth from himself to the characters he plays, and then back to himself in an afternoon of open-air theater. Mostly, he knows when he's Webber or when he's Webber playing a role. Sometimes the boundary between "he" and "I" dissolves, and Webber is Twain or General Vallejo. What he's done as Sonoma's alter ego, he hopes to do for Napa, and that could spell trouble; a real split personality disorder could develop. Meanwhile, he's happy doing his Sonoma schtick, and Sonoma is happy, too. Town and man are a good fit. Both love history, and neither has a fixed identity. Moreover, they're both private, despite their shameless self-promotion. Webber rarely, if ever, talks in public about his years at the Pacific Stock Exchange. About the town he's adopted as home, he observes, "Sonoma has two sides. It's both farming community and bohemian enclave, so some folks call me 'George,' others call me 'the General.'" George's wife, Cathy, who joins his act as Yvette, has lived with Webber's multiple personalities for years. "When I met him, I had no idea what I was getting into," she says. "I still don't know who he'll be at the end of the day. "—J.R.